Ever notice that life seems to be speeding up? Each day seems to fly by and everyday moments that have meaning pass us right by… but thats where technology comes in right?? I’m not sure what in the world I’d do without my camera phone and photo printer! I’m able to capture those everyday moments that turn into irreplaceable memories! Of course, once they’re captured, you’ve got to display them. Right? So… you managed to snap that picture in the nick of time… you’ve printed them out… now what do you do?? Time to get creative!! I’ve got 23 ways for you to display those precious everyday memories! Doesn’t matter if its your child’s art, a picture of your fur-baby or an irreplaceable memory, get creative with your displays and you’ll enjoy looking at those memories even more! Whats your favorite way to creatively display your pictures? I tape old pictures all over everything in my office! Love these ideas. So many ways to document and display our memories! Awww, these photos made me smile! Thanks for including the Pet Photo Cube from CraftsnCoffee.com. I make a photobook every year around our anniversary to show off the pictures from that year. Thanks for these great ideas! I love displaying pictures and I haven't printed any in a long time. Thanks for these ideas!! Love these ideas! I’ve been thinking of doing a gallery wall myself. Thanks for sharing! That baby shadow box is TOO cute!!! These ideas are so cute! I really need to start making more photo books! Great Ideas. I need to do something in my office with bare walls. Love these ideas! My favorite way is various shaped frames on the wall all together in a collage of sorts. Great ideas! I love showing off pictures & artwork! 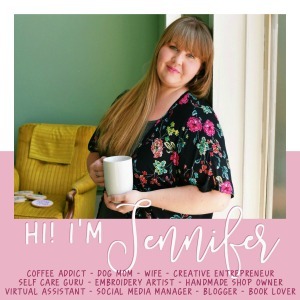 Love this roundup, Jen! (Pinned.) Thanks for included my photo tile! Love the photo cube and shadow box! I have lots of little things saved for both of the kids that need to be put together into something like that. I love the idea of the baby shadow box !